It includes all of the features and details how they work for you, the special things about Wolf and, most importantly: whether the DF304 is worth the price! The Wolf Dual Fuel 30 Inch Range (the DF304) is the smallest of Wolf’s four range sizes.The next largest range and largest oven that Wolf makes is in the 36 inch range. Dual fuel means that natural gas is used on the rangetop (a propane gas option is also available) and electricity in the oven below. This “pro style” range has many of the most important features that the best pro ranges have. 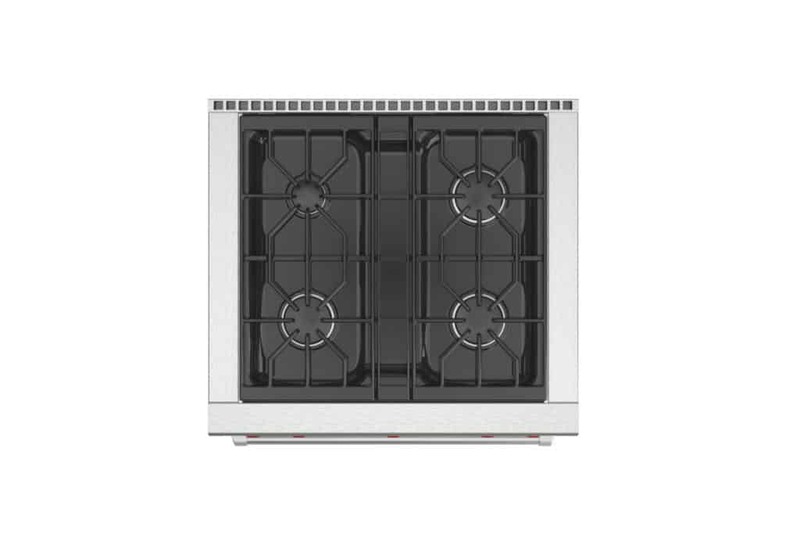 These features include a superior convection system, control panel with temperature probe and burners that will reliably simmer or scorch. Also important, Wolf ranges have the look and finish that you will love to see in your kitchen. Add to these attributes the iconic Wolf brand that is stamped on the range. 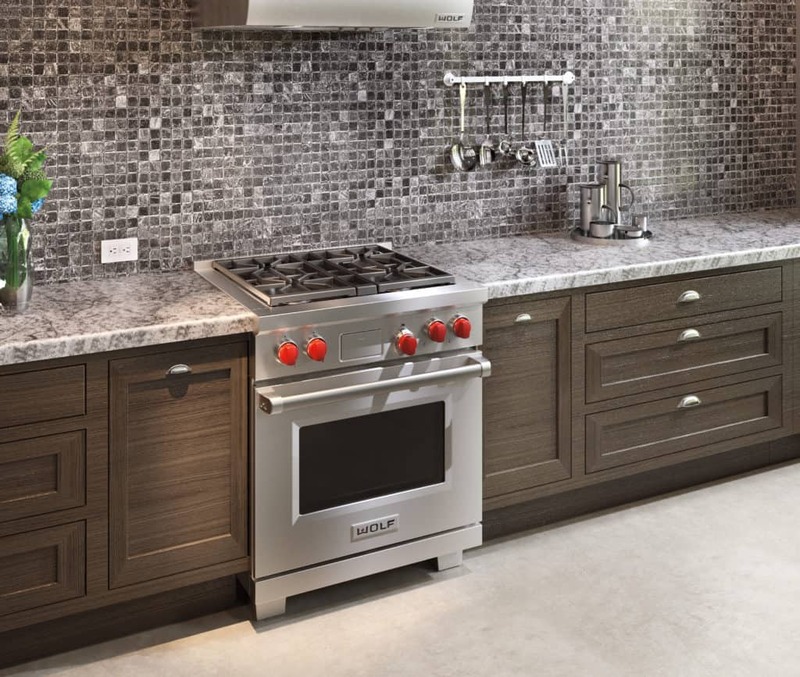 Imagine how that Wolf range will look in your kitchen as you entertain your guests. The Wolf brand and range features that are described in this article will give you enough detail to make sure you have done your homework on the Wolf brand and the DF304. Use the table of contents here to skip to something specific or just read through the entire article. What Makes The Wolf Brand Special? What Is On The DF304 Rangetop? What About The Wolf Burners? What About The DF304 Oven? What Else Is Featured In The Oven That Wolf Doesn’t Mention? What Are Some Of The Other Oven Details? How Does Self Cleaning Work? Anything Else About The Wolf DF304? So Is The Wolf DF304 Worth It For You? You may have looked at some of the other 30 inch ranges and wondered, why Wolf, and is it worth its premium price? The short answer is quality and durability, Wolf ranges are solidly built, period. Wolf was founded in the 1930’s as a commercial range manufacturing company by brothers Al and Hyman Wolf in Los Angeles. Wolf was among the first “pro style” home ranges to be designed and built for home use. You can read more about the history of Wolf here in the range product guide, including its acquisition in 2000 by Sub-Zero, another quality brand. Wolf designs their ranges to last more than 20 years under heavy use. If you compare Wolf to other lower priced ranges, you might find that the lower priced ranges will cost more over time in repairs and replacement. Simply put, most of these ranges won’t last nearly as long as a Wolf range will. Wolf “stress tests” their ranges in their factory in Madison, Wisconsin. Wolf factory tests simulate extra heavy use to make sure they hold up for decades. Think about it and look at the reviews of lower priced ranges. You might buy a $1,500 range that lasts maybe four years. Over twenty years, you will have spent the equivalent of $7,500 in replacing it and repairing it. You can pay a lot less for a Wolf range now. The current 30 inch range features dual-stacked burners (two burner rings on top of one another) that provide one of the best simmer burners on the market. The three cast iron grates on the rangetop give you a continuous cooking area across the entire range. You can make full use of the range while multiple dishes cook, cool, and reheat. You won’t have to move hot cookware somewhere else in your kitchen, just leave it on the rangetop. The simmer setting for each burner consistently maintains a fixed simmer that is adjustable in intensity. You can engage just the lower burner ring with the turn of the knob one way (low). With just this ring engaged, you can adjust to a wide range of simmer settings. Turned the other way and the range knob will engage both burner rings for high heat searing and boiling. All of the Wolf rangetop burners are sealed, but have a lot of power. The highest burner rating tops out at 20,000 BTUs in the front burner (a recent upgrade from their 15,000 BTU burner). This is more than enough power for anything you want to cook with your burners, even wok cooking with a wok accessory. The others burners are rated at 9,200 BTUs, 15,000 BTUs and 18,000 BTUs. These will cover the range of heat needed for most cooking applications, from simmer to sear to boil. Each burner also includes an auto re-ignition system. If a burner happens to blow out, it will automatically re-light as long as the knob is still turned on. It’s nice to know that if your burner did happen to blow out that you wouldn’t have to worry about re-lighting it. If you didn’t notice it blowing out, it’s also good to know you won’t have to worry about unlit gas spreading through your kitchen! The range is controlled by several knobs that come in Wolf’s iconic red by default (you may also choose black or stainless steel). Another control feature is the electronic control display that you can hide completely in the range if you don’t want to look at it. The electronic control panel allows for timed cooking, including delayed cook start times and provides precise oven control. Also important, the control panel works with a temperature probe to alert you when that big thick roast is at its perfect temperature. You just have to insert the probe in the thickest part of a roast, for example, or whatever else you may be cooking. It’s always nice to know that your delicate souffles or large roasts are fully cooked without having to take them out of the oven to check. Also interesting, if you find that you might need another small Wolf oven with the same features as the 30 inch oven, consider the Wolf Countertop Oven. You can read a full review here. Dual convection uses two convection fans, not one, and each convection fan has its own separate heating element, the definition of “true convection”. These dual fans (each with their own heating element) are positioned side by side in the oven. They are designed to move oven air around your oven evenly and consistently. It’s great to know that you won’t have raw cookie dough in the back of the oven and burnt cookies in the front. Many of the convection ranges on the market are just single fan convection systems. These will do the job for the most part, but dual convection is much better when you’re using the convection mode. The electric oven in the DF304 has an 8-pass infrared broiler in the top of the oven rated at 3,600 watts. It will sear the heck out of your steak. The bake heating element system is hidden in the floor of the oven. This design gives you more space inside your oven and has an inner and outer heating element. The inner element rated at 1,000 watts and an outer rated at 1,200 watts (both based on 240 amps). Wolf doesn’t really detail any of this information in their promotional materials, but it is important to know what kind of power your oven is capable of. Also, it’s important for you to know how many passes are made through the cooking element (eight passes in the Wolf oven is a good number, basically more passes the better). The usable oven capacity in the DF304 is pretty good with 2.8 cubic feet of usable space when you deduct for racks and other interior oven components. The interior oven space of the oven without these interior component is over 4.5 cubic feet. This higher measure is how most other manufacturers measure their interior ovens if you’re comparing against other brands). It measures 25 inches wide, 16 ½ inches high and 19 inches deep. The oven is wide enough for most cooking trays. It also has a distinct blue porcelain coasting inside. Convection, Bake, Convection Bake, Broil, Convection Broil, Roast, Convection Roast, Proof, Dehydrate and Pizza Stone. Proof mode sets the correct low oven temperature for rising bread, so you can let it rise in the oven rather than in an uncontrolled area of your kitchen. Dehydrate will help to dry fruits and vegetables (even meat with beef jerky) with an available dehydrating kit. Dehydrating will save you a lot of food (and money!) over time by extending the life of food that would otherwise go to waste. 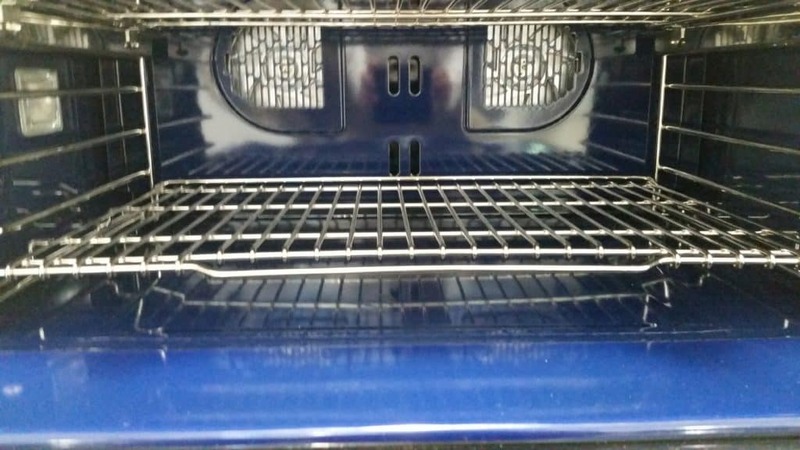 Each oven also comes with three oven racks. One of these extends all the way out of the oven to help you get hot food out easily. Wolf ovens have five rack positions in each of their ovens. Remember that with Wolf’s “true” dual convection, you should be able to leave your trays alone during cooking. 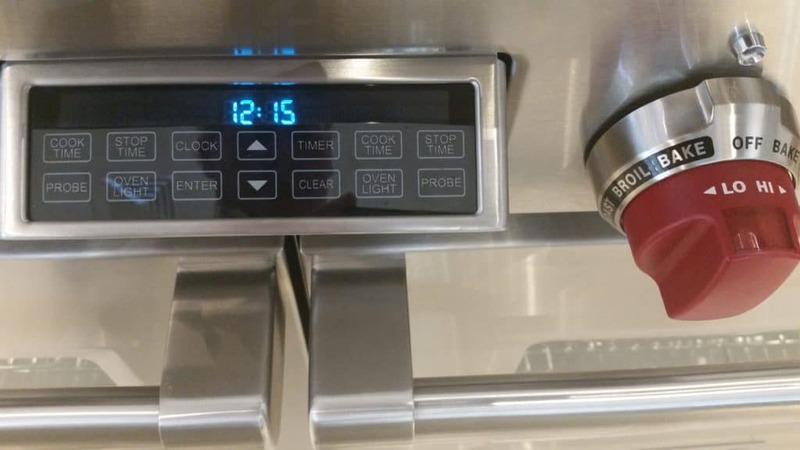 The the air will already be moving around inside your oven. This is good to know if you regularly use the same rack positions for food that you cook regularly. You don’t have to go through the process of moving the racks up and down inside the oven. This especially helps when they’re hot, you can just leave them alone. The oven self-cleaning mode gives you a choice of a three or four hour self-clean cycle. Self-cleaning uses the highest oven temperature to basically bake off oven residue by setting each element at it’s highest temperature. You can also interrupt the cleaning cycle any time that you may need to. The oven is Star K certified. This mode will disable the range in compliance with religious standards. You can also convert the fuel source to propane if you have better access to propane than natural gas. It’s also good to know that the oven window is triple-paned for maximum heat insulation and durability. You will also be happy to know that the Wolf customer service representatives are available around the clock. If you have any support issues, any time, just give them a call. The warranty period for Wolf ranges is up to five years for major components. The full service warranty lasts for two years. Detailed information on the warranty can be found in the Wolf range product guide here. Use the table of contents to go straight to the warranty information. The Wolf brand, whether you care or not, makes a statement in your kitchen. But more important is: why does Wolf have such a prestigious image? It’s really about the quality, and in turn, the durability. The quality of the range is definitely worth the price if you cook regularly or will start to cook regularly. The dual fan convection with built-in heating element is definitely a big deal. This Wolf oven is among the best pro range ovens you can get. You will see quality results in baking, searing and temperature probe cooking to precise temperatures in this oven. Remember: all of these features are integrated into a range that is built to last for a large part of your life (20 plus years). If you value those features (you should! ), then the Wolf DF304 is going to look great in your kitchen for a very long time.